Yep - the 2nd annual Summer Classic will return to the East Brother taproom on August 26! 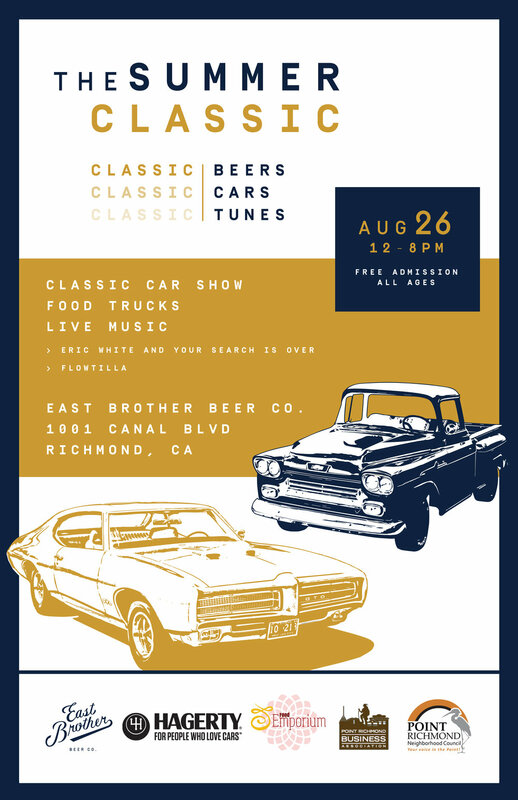 We'll say goodbye to summer with a celebration of classic cars, classic music…and of course our classic styles of beer. Do you have a classic car you'd like to show off? We're accepting all vehicles that are pre-smog and will have a growler trophy for the top two people's choices. To find out more, please call 510-230-4081 or email us at info@eastbrotherbeer.com. A big thanks to our sponsors who help make this event possible! Thank you Hagerty Insurance, Point Richmond Business Association, Point Richmond Neighborhood Council and Food Emporium!